METAL MEDIC is locally owned by Ken Garrison. We are a family oriented auto body business that also provides in house Paintless Dent and Hail Repair, that proudly serves the Central Illinois area. We are a full service auto body repair shop and Collision repair center that uses the latest tools and techniques to ensure your repairs are done right. Over the past several years we have provided all types of auto body and collision services for family cars, local law enforcement agencies, fleet management companies, dealerships and more. 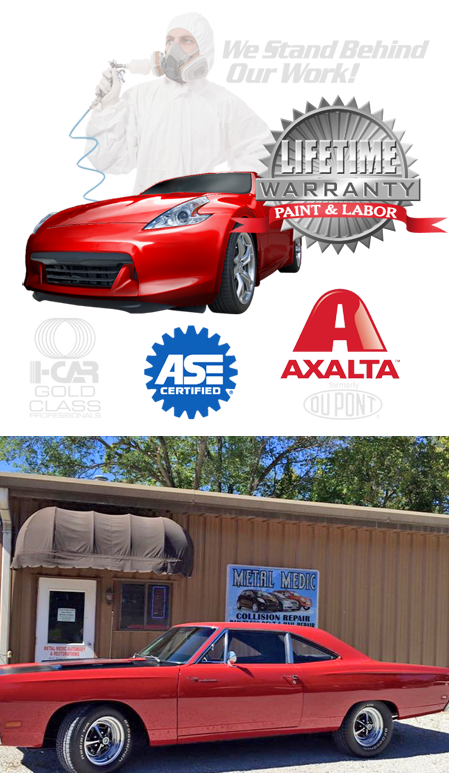 At Metal Medic Autobody, we are committed to earn your business by making you the customer our Priority. We pride ourselves as having quick response times, a very courteous staff, and exceptional rates. We provide auto body collision repair and automotive painting services, plus premium Paintless Dent and Hail Repair ( PDR), for all makes and models including imports, performed by highly trained, certified , experienced technicians.